The traditional hot whiskey recipe uses only 4 ingredients, plus hot water and is a famous cure all for the winter months. Known as Hot Whiskey in Ireland and Hot Toddy elsewhere, this winter warmer is delicious and restorative anywhere and in any language. Combining smooth whiskey, sharp citrus and aromatic spices, it is credited with almost mystical curative powers. Like the chicken soup so beloved of the Jewish community, it is thought to relieve colds, flu and sore throats and, even when it can’t cure an affliction, it seems to make the sufferer feel less woebegone! In addition to being a sovereign remedy for sniffles and sneezes and a general winter warmer, Hot Toddy has many subtle layers of flavour and is a delightfully festive celebratory drink during the colder months. 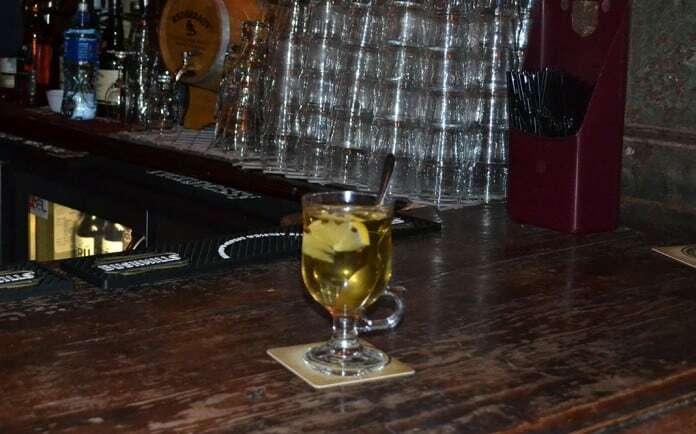 A well-executed Hot Toddy can be enjoyed at Halloween, Christmas and New Year in place of less soothing cocktails and tipples. Recipes for this flavoursome treat vary, with many a secret ingredient finding its way into a pub’s or family’s Hot Whiskey. Take some just boiled water. Pour it into a glass into which you have placed a teaspoon. The teaspoon will prevent the glass from shattering on contact with hot water. Allow the water to warm the glass for a moment or two, then pour it away. Add the Whiskey to the glass, then the sugar and a little hot water. Stir this mixture then add a slice of lemon into which you have pressed 3 or 4 cloves. Leave the Hot Whiskey to infuse for a few minutes, then taste before adjusting the sweetness with more sugar or the sharpness with the lemon juice. Common variations in a Hot Whiskey Recipe include replacing the sugar with honey and the addition of cinnamon or nutmeg.